If you use a SD -> USB dongle, the SD card will appear at /dev/sdX, not /dev/mmcblkY. Note: you might need to install the dosfstools package (or equivalent) for the mkfs.vfat command. Mount the fat32 partition and copy the kernel on it. Now we're going to deploy the Gentoo image on the second partition. The tar command will probably take some time. You should now be ready to boot Gentoo on the Beagleboard. After a little bit of configuring u-boot, that is. 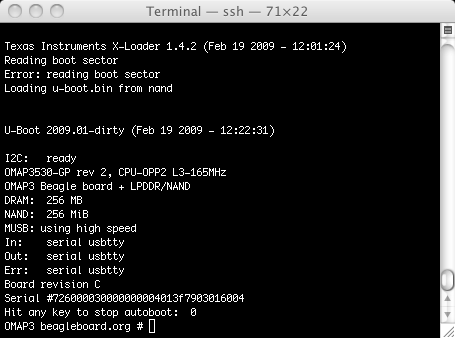 Insert the SD card in the Beagleboard, boot the board and interrupt the boot sequence by hitting any key. - if you're not using ttyS2 (the RS232 P9 connector on the board), then you'll need to change that for something else. - use mmc init instead of mmcinit with recent uboot versions. Now, if you type boot, Gentoo should boot. 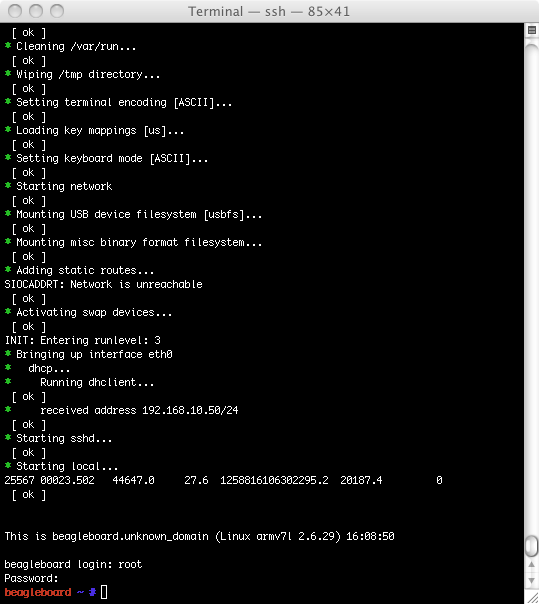 Once the board has finished loading, login as root/admin. Use passwd to change the root password. Note: the tar command will take some time. Be patient! You can use the dedicated forum to discuss the project or ask for help! Page generated by the SlashOrg Miniboard in 0.0046 seconds using 6 SQL requests.